I recently acquired this book shelf in an antique auction. I was told it was imported from East. It seems very old furniture. It is quite heavy. It seems some kind of veneer is applied on the front face. Could anyone recognize what type of veneering and what part of world it is known for?. It looks more like bark than a veneer. Bark may have been used for that rustic look. Looks like bark veneer to me too. It should be fairly obvious on the edges, that is, if they left a sliver of wood to hold the bark together. You see this sort of thing done all the time at flea markets and craft shows where they take an old piece that was nothing special or even make a new piece from salvaged wood, intentionally distressed wood or wood from pallets and add bark planks to make it look more rustic. Lazyman, you are correct. 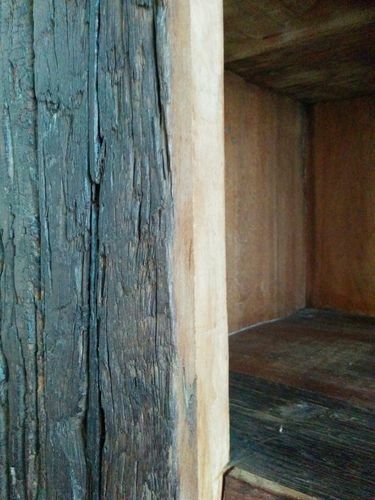 It appears some sort of layer (thick one though) of bark on the base wood. Have you seen this kind of thick veneers? 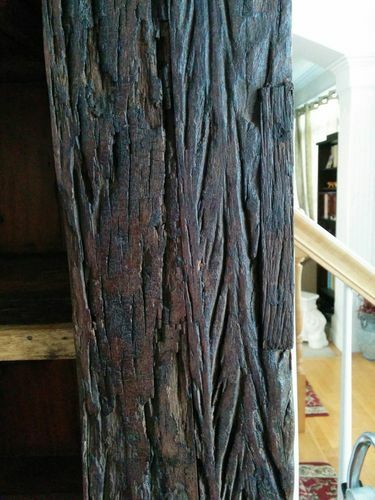 Not exactly done in this way but I have seen bark used in a similar way on smaller decorative items but they were all recently made and not antiques. Thanks for the info. 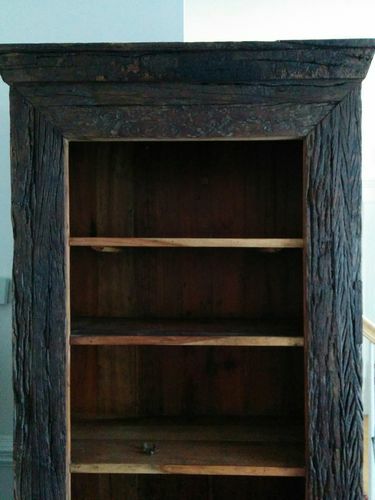 Anyways, I did not pay much for so called ‘antique’ book case. I just paid $20!. You cannot beat amount of solid hard wood contained in that shelf for that money!